Carrying forward the exemplary justice done to the exterior design, Hyundai has ensured that the Eon’s interiors measure up. Having said that, small cars are a tough task for any manufacturer as their primary role is to keep costs down, and therefore materials used have to fit the bill. The Eon is a little plasticky on the inside, but the execution in terms of sculpting the plastic, its fit and finish and overall visual appeal end up taking market expectations up not just by a notch but to a whole new level. The fabrics used on the door panels and seat trim are also of a decent quality and customers will find no reason to complain. In terms of space, the Eon manages to offer a decent level on this front as well. Thanks to its ‘tall boy’ stance, the inside offers an element of spaciousness that could best be compared to the likes of the Hyundai i10. Seating is comfortable and four adults can easily fit inside; however five would be a bit of a squeeze. The boot offers enough for a family to pack enough away for a nice weekend getaway and there are a host of storage spaces available within the cabin to tuck away those knick-knacks. Once again, the Eon scores against the Alto in terms of design aesthetics, space and functionality when it comes to the interiors. With a kerb weight of 725kilos the Eon has a decent 77.24PS per tonne though with the tall ratios don’t expect the Eon to make progress very fast. So 100kmph comes up in a lazy 19.08 seconds by which time you are also inching very close to the quarter mile mark, that’s how much distance it covers to get to 100kmph. The quarter mile then takes another eight tenths of a second. With the strong low. and mid range but just noise at the top the Eon feels slow in the roll-ons. Third gear overtaking acceleration is decently fast but shift into fourth or fifth and the 40-100kmph runs feel like an eternity has passed, both runs recording well over 25 seconds. The Eon is quicker than the Alto by a slim margin but at nearly two seconds, a margin it is. That said all of Hyundai’s efforts have been put into fuel efficiency. According to the ARAI figures the Eon returns an overall of 21.1kmpl, on our test cycles however she returned 15.6kmpl in the city and on the highway a brilliant 24.3kmpl but the overall adds up to just 17.75kmpl which is much lesser than what Hyundai claims. A light steering makes the Eon well suited to Indian city traffic conditions and a tight turning circle allows cheeky moves through traffic. 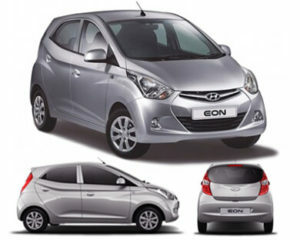 However, the Eon isn’t fun to drive and the uneven feel the steering offers contributes to this. There’s lots of slack around the straight-ahead position, but when you pile on the lock, the steering suddenly quickens to the point of being over-responsive. This takes some getting used to at higher speeds and the quick turn-in can also catch the novice driver off-guard. Another negative is the lack of sufficient self-centering action, so you have to keep a firm hand on the steering at all speeds.